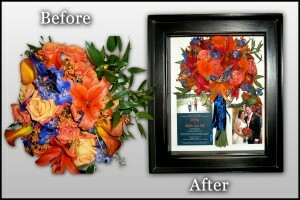 This stunning arrangement was done for a wonderful women named Juli. Her and her husband are huge fans of the Denver Broncos (hence the orange and blue colors). You can also see the cute couple sporting jersey’s of their favorite team in their engagement photo inside the shadowbox she chose. This stunning bouquet will last for generations to come in this stylish rustic pine black shadowbox display case that has been custom designed to the couples themed special occasion. Thank you Juli for allowing us to work with you to create this bright memorabilia display that will decorate your home for years to come. In order to create your own custom designed encasement call us at (801) 227-0075 for more information or to find a dealer near you. Also, find out how to own your own franchise and create these special encampments for those in your own neighborhood.